… and avocadoes, mangoes, kumquat and kiwi, too. Kathryn and Keith Selfe from Carreglefn Nurseries, Anglesey (01407 711148), write about the wide range of exotics and tropical plants suitable for the British climate. “Citrus, difficult? Not really! Citrus (Lemons, Oranges, Limes etc. 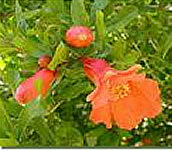 ), as with many plants, includes a wide range of varieties, some tough and some tender. It’s a case of selecting the right level of hardiness for your particular growing situation. “If you are lucky enough to have a conservatory or greenhouse for overwintering, then the list of suitable varieties is long. If you don’t, then tough ‘Farmers’ Citrus’ (commercial fruiting varieties) will happily grow outside. Karen Stacey, Head of Hardmoor Early Years Centre in Southampton, and gardening club parents, Denise and Emma, received the Hampshire Gardens Trust (HGT) Peter Maunder Trophy at the AGM in April. Each year, the HGT awards the trophy to the group in Hampshire that has made the most distinctive contribution to school gardens that year. Denise and Emma, gardening club volunteers at the Centre, worked up some designs with Karen’s support, to bring back to life a shady and overgrown corner of the playground. Together with an HGT grant, donations from local organisations and the help of local contractors, Marc Waterman and Ollie Fletcher, they developed the space last year into a highly interactive sensory garden with lush planting, story telling area and outdoor classroom. Two years on from reports of a nationwide contamination of composted stable manure by the new hormone herbicide, Aminopyralid, it still appears to be an ongoing problem, despite the products containing this herbicide having been taken off the market at one time. Back in June 2008, gardeners and allotment holders across the UK started reporting crops mysteriously dying off, or failing to grow properly, following the addition of proprietary and well-rotted stable manure to their soils. Aminopyralid was developed to kill broadleaved weeds on grassland. It clings strongly to plant tissues but it appears that when ingested by animals, the chemical doesn’t get broken down in normal digestive processes but is passed straight through urine and manure and onto bedding materials. Consequently, high concentrations of Aminopyralid remain despite normal rotting and composting processes, affecting the growth of sensitive plants, particularly beans, potatoes and tomatoes grown on the manure. If there’s one plant that can be described as ‘sunshine in a packet’, then it has to be Eschscholzia californica, the Californian Poppy. After the weather became more unsettled in north Wales towards the end of June, a hastily sown patch of these poppies came into flower at about the same time and have added a welcome splash of brightness and warmth to our front garden every day. 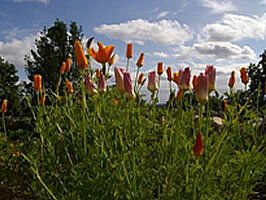 I sowed a packet of Eschscholzia californica Monarch Mixed directly into recently prepared soil back in May. They germinated rapidly in the warm conditions and are likely to self seed nearby, too, meaning that we will have these cheerful, nodding flowers for some time to come. The colours in this mix range from cerise pink through golden orange to vanilla white over glaucous, blue-green feathery foliage. Ideal for a sunny position on poor soil. According to the history books, the last time that mainland British soil was invaded was by a small French raiding party in 1797 along the north Pembrokeshire coast. But if you think that we have kept the British Isles free from menacing aliens in the 200 years since then, then I’m afraid you’d be wrong! Via the fairly innocent route of introducing exotic and unusual plants into our gardens, some ‘escapees’ have rapidly colonised many areas of the open countryside. In a mountainside garden, sooner or later you have to deal with steps. We needed to replace the narrow steps up from the front drive area towards the house entrance. Working with our walling contractors, we incorporated curving steps that sweep up in an unusual but attractive way. I used a well known formula for calculating optimum tread (T) and riser (R) dimensions: 2R + T = 26” (660mm). The steps work really well, and a large boulder that was lying in the garden now has pride of place as our ‘greeting stone’. We also relocated our old iron stove postbox to a convenient place at the foot of the steps at the same time. 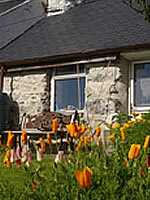 Garden Design Competition for Wales? According to seasoned rock climbers here in North Wales, the best midge repellent on the market is… Skin So Soft by Avon. Winter finally loosened its icy grip sometime around Easter in our neck of the woods; and as ever, it was the actions of the local fauna and flora that brought the change of the seasons to our attention. While we were busy on a myriad tasks, two pairs of rooks established nests in our central and top chimneys! We now have noisy flues and much buzzing and low flying from over-protective parents when we are in the garden. One of our neighbours also let us know that the mountainside is being plagued by rabbits for the first time in many years. I have lost sproutings in one raised bed to the munchings of a bold bunny and have now covered all beds with chicken wire. And despite best efforts to tame the raspberry patch last autumn, stray runners have spread far and wide in a bid to confound and demoralise me!